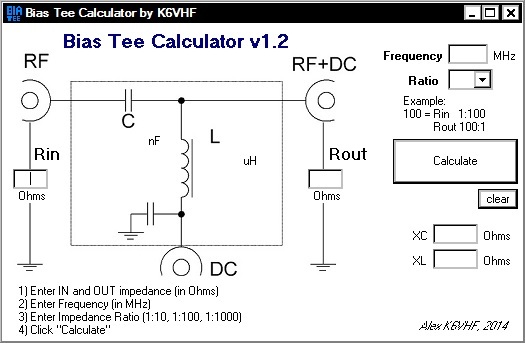 This is my most recent program and it’s Bias Tee calculator which helps to calculate the values for a typical bias tee circuit (capacitance C and inductance L). You have to put input and output impedance, frequency and impedance ratio (usually value of 100). Right now the XL and XC calculates based on fixed impedance ratio but in next version they will be variable depend on different brands of capacitors and inductors.